Similar to most other ready to eat foods that Listeria monocytogenes like to grow in, the shelf life is quite short and some consumers consume the ready to eat products right after purchasing. Other products such as canned foods that Clostridium botulinum can grow in, the shelf life can be up to 2 years which gives plenty of time for recalls as those consumers may not consume them immediately after purchase. 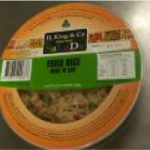 The recalls for ready to eat foods such as the pre-packaged fried rice can serve the purpose of taking the food off store shelves to prevent future consumers from getting sick. However for the consumers who have consumed contaminated products before any recall notification, some of them may not even get sick due to the natural microflora present on their intestinal surfaces. With all the conditions Listeria monocytogenes can grow or survive in ready to eat products, I feel that one of the better ways to minimize the risks of getting ill from Listeria monocytogenes is to heat ready to eat products except for frozen products before consuming. Although this might be difficult for ready to eat foods that are generally eaten at room temperature such as sandwiches. Are there any other methods that you think are sufficient in eliminating Listeria monocytogenes? I am glad you brought up that listeria monocytogenes can survive acid and low water activity environments, just as Trish has mentioned in her presentation. Although L. Monocytogenes is a heat sensitive microorganism once it contaminates processing equipment it will be a major issue because it can form biofilms, which protects the pathogen. Contamination usually occurs after post-processing as you mentioned ready to eat products. I think the general public does not need to be too concern when consuming these products. However, young children, pregnant women and immunocompromised individuals should be careful. If possible the susceptible population to try to avoid these foods in general because the serious consequences can result in listeriosis or even death. I agree with Colleen that Listeria monocytogenes may have been introduced to this product through post-processing contamination. Potential sources may be due to unsanitary premises, unclean air ventilation, contaminated packaging and/or temperature abuse. Even though this product may pose a serious health risk for immunocompromised individuals, I find it rather surprising that there are no further details available since the date of the recall. Since Listeria monocytogenes is ubiquitous in the environment, I strongly believe multiple methods are necessary to control the presence of this pathogen. These measures may include reassessing the company’s HACCP program to reinforce proper sanitation practices, frequent microbiological monitoring and appropriate storage temperatures. A combination of rapid pathogen detection methods should be utilized because some techniques, such as PCR, may detect false positives. Alternatively, the company could look into reformulating the product to include more hurdles, such as adding antimicrobial agents and increasing lethality of the heat treatment. Applying different treatments and storing susceptible food components in separate packages (combined by the end user during consumption) may lower favorable conditions for bacterial growth. 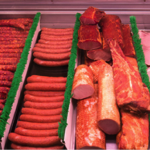 These methods may also extend the product’s shelf life. Comparing to other pathogenic microorganisms, Listeria monocytogenes can be resistant to many stresses during the processing and before consumption which causes it becomes one of the biggest concern for consuming the ready to eat food. I agree that the best way to eliminate L. monocytogenes in the high risk ready to eat food is heating the product to at least 74C. However, the manufacturer of the ready to ear food should improve their food safety system as well which may include sanitation procedure, regular equipment checking, personnel hygiene etc, especially that L. monocytogenes can form biofilm on the surface of the equipment, so regular microbiological testing will be necessary in the ready to eat manufacturing company. Complete final products checking and testing will be needed to ensure the absence of L. monocytogenes in the ready to eat foods. As Listeria monocytogenes is one of the pathogens that can withstand many hurdles during food production and storage, it should be especially cautious and have very strict regulation system regarding production that is easily susceptible to Listeria Monocytogenes contamination. 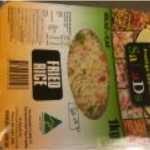 However, in this article in particular, I believe that these pre-packaged fried rice would be mostly consumed by healthy individuals probably those who do not have the time to make one themselves such as college students and workers. Thus, although we should be concerned and pay close attention to be able to prevent further contamination, I don’t think it would result in severe outbreaks like some other pathogens. As elderly, pregnant women and infants are most vulnerable to contamination, I do not think this particular product would create such a disaster. Nonetheless, I think better sanitation in the production environment and more strict regulations could possibly lead to prevention of this pathogen. It is interesting to learn the specific details about how Listeria affect vulnerable people like pregnant women and their unborn or newborn children, seniors and the immunocompromised. And it is shocking to see how AIDS change life by looking at the number “people suffering from AIDS are 300 times more susceptible to being infected by Listeria monocytogenes compared to healthy individuals”. Ready to eat food can be a great threat since people tend not to process them at home after purchasing and consume them directly. A better controlling on production, distribution and retailing of ready to eat food products is important to protect these vulnerable people from getting harm. Good information on Listeria Monocytogenes. Contaminated ingredient is mostly likely the starting agent to the contamination as there has to be an introduction of Listeria Monocytogenes into the processing facility or food. There could be other contaminants such as rodents due to poor pest control program at the processing facility. Just browsing through their website, it looks like they process many items, including dairy and produce. Good sanitation standard procedures should be in place to prevent cross contamination. The firm should monitor their suppliers by testing their ingredients and packagings for pathogens or indicator organisms.